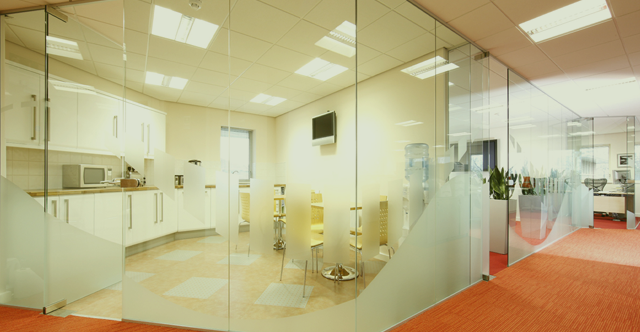 Here at Attcost’e, we provide and install a stunning array of glass partition walls. Glass partitions provide a stylish and modern feel to your business whilst allowing a seamless finish and an unhindered vision. You can benefit from increased levels of light, whilst also maximising space with glass partitions. Not only this, but in-turn you will create an inspirational environment for your workforce to appreciate. Glass office walls provide a design innovation that will impress employees, clients and guests, ensuring that not only do you have an attractive office, but a practical one too. Our internal glass walls, also referred to as our glazed partition systems look utterly chic when implemented as office walls. If you are looking to modernise a dull and dreary space, then our glass walls will certainly transform your office into a bright and sophisticated space for all to enjoy. Our glazed partition systems really can convert your office from a dishevelled disappointment into a desirable delight and can be enjoyed in either 10mm or 12mm toughened glass. For office use, glass partitions work effectively to combine both functionality with the captivating clear advantages of silicone glazing. Implementing a reduced number of aluminium framing sections, your office will be provided with a beautiful and captivating feature that maintains the privacy of individual offices within your workplace. We provide a variety of specialised glazed partition systems including our spectacular frameless glazing system, allowing glass to extend from floor to ceiling and wall-to-wall utilising a minimalist framework. You can opt for either single or double glazed partitions, dependant on your requirements, whilst being able to select from a vast variety of manifestation options. We also provide demountable and relocatable partition systems which offer the ultimate in acoustic performance as well as up to one hour fire protection. You can select from a range of width and panel options, ensuring a versatile and effective partitioning system for your workplace. Whether you are looking to incorporate a light and airy appearance into your office, having glass walls installed is certainly the more effective way in which to achieve this. Not only can you enhance your working area, but you can create an entirely new feel too. By enhancing the levels of light you will notice the atmosphere changes from negative to positive. If you are unsure of the style you require then contact us at Attcost’e today and we will be more than happy to assist you in your decision making process.